Universal Parks & Resorts (July 30, 2018) – Things are about to get turned upside down at Universal Studios’ Halloween Horror Nights’ with the first look reveal of the “Stranger Things” maze key art designed exclusively by Kyle Lambert, the official illustrator of the mega-hit Netflix original series. Featuring the series’ cast standing adjacent to the predatory Demogorgon, the ominous image depicts a nearly palpable account of what guests can expect to experience when the “Stranger Things” maze debuts as part of “Halloween Horror Nights” this fall. The “Stranger Things” maze, inspired by season one of the Netflix series, will come to life at Universal Studios Hollywood and Universal Orlando Resort beginning, Friday, September 14 and at Universal Studios Singapore beginning Thursday, September 27, 2018. 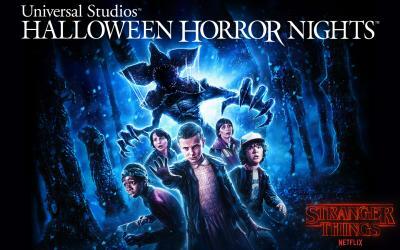 The parallel universe, referred to as the Upside Down, that terrorized the small town of Hawkins, Indiana in “Stranger Things,” will bring the chittering, predatory Demogorgon to “Halloween Horror Nights” to stalk unwitting guests as they encounter iconic scenes, characters and environments from the mesmerizing series. Working collaboratively with Netflix, along with the creators and executive producer of the blockbuster series—Matt Duffer, Ross Duffer and Shawn Levy, the mazes will be authentic representations of “Stranger Things,” designed to transport guests into artfully recreated scenes and storylines. From the menacing Hawkins National Laboratory, under the U.S. Department of Energy, to the Byers home adorned with an erratic display of flashing Christmas lights and the eerie Upside Down woods oozing a shower of floating orb-like spores, the chilling new mazes will offer surprising twists and unexpected turns around every corner. Universal Studios’ “Halloween Horror Nights” is the ultimate Halloween event. For more than 25 years, guests from around the world have visited “Halloween Horror Nights” to become victims inside their own horror film. Multiple movie-quality mazes based on iconic horror television shows, films and original stories come to life season after season, while the streets of each park’s event are transformed into highly-themed scare zones with menacing scare-actors lunging from every darkened corner. For more information about “Halloween Horror Nights” visit www.HalloweenHorrorNights.com. Universal Studios Hollywood is The Entertainment Capital of L.A. and includes a full-day, movie-based theme park and Studio Tour. As a leading global entertainment destination, Universal Studios Hollywood delivers highly themed immersive lands that translate to real-life interpretations of iconic movie and television shows. Recent additions include “The Wizarding World of Harry Potter™” which features a bustling Hogsmeade village and such critically-acclaimed rides as “Harry Potter and the Forbidden Journey” and “Flight of the Hippogriff™”. Other immersive lands include “Despicable Me Minion Mayhem” and “Super Silly Fun Land” as well as “Springfield,” hometown of America’s favorite TV family, located adjacent to the award-winning “The Simpsons Ride™.” and the “The Walking Dead” daytime attraction. The world-renowned Studio Tour is Universal Studios Hollywood’s signature attraction, inviting guests behind-the-scenes of the world’s biggest and busiest movie and television production studio where they can also experience such authentic thrill rides as “Fast & Furious—Supercharged.” Coming in Summer 2018, Universal Studios Hollywood will welcome debut The DreamWorks Theatre featuring the premier attraction, “Kung Fu Panda: The Emperor’s Quest.” The adjacent Universal CityWalk entertainment, shopping and dining complex also includes the all-new multi-million dollar, redesigned Universal CityWalk Cinema, featuring deluxe recliner seating in screening room quality theatres, and the “5 Towers” state-of-the-art outdoor concert stage.